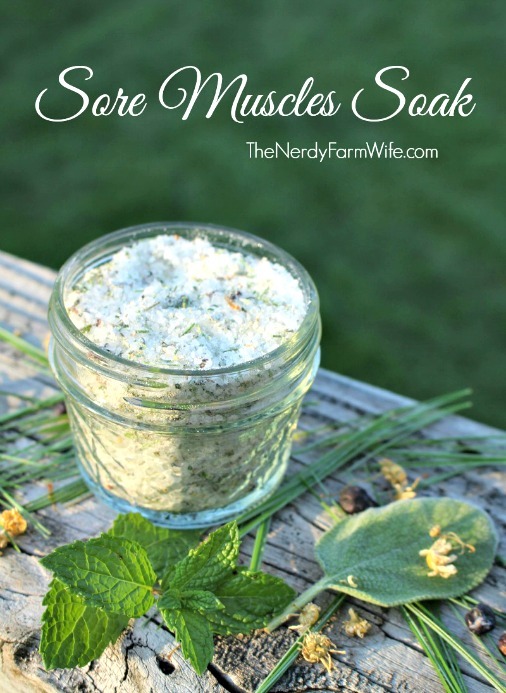 Jan selected this recipe for a sore muscle soak from the first unit in the beginning herbal class at the Herbal Academy of New England. The bath soak relieves muscle soreness, aches and pains. The recipe uses a wonderful combination of herbs, berries, essential oils and some other ingredients. You air dry the herbs, crush or grind them, add them to some other ingredients in a muslin cloth or bag. You can then hang the back over the faucet as you run a warm bath. The water diffuses the herbs into the bath. It really is a spa treatment. What interested me were some of the ingredients. You’re probably familiar with the benefits of Epsom salt since it’s often used in bath soaks. I review just a few of those benefits below. Some of the other ingredients in this recipe are wonderful additions to a sore muscle bath soak. Epsom Salt is made up of the compound magnesium sulfate. Including this ingredient in the bath soak restores both magnesium and sulfate to your body. The magnesium and sulfate are absorbed through the skin and can improve circulation, remove toxins and ease muscle pain.